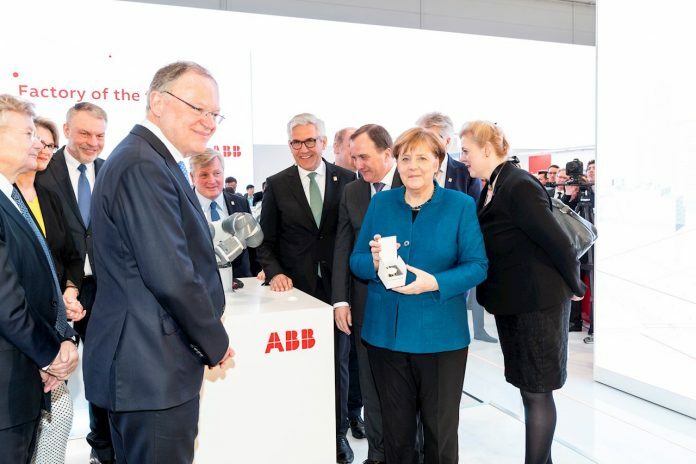 ABB CEO Ulrich Spiesshofer has given German Chancellor Angela Merkel and the Swedish Prime Minister Stefan Löfven a glimpse into the factory of the future at this year’s Hannover Messe, one of the most important trade fairs in the world. Chancellor Merkel and PM Löfven were able to witness firsthand how a production cell would work in the factory of the future, where robots will collaborate with humans. They were shown how ABB’s two-armed YuMi robots together with single-armed YuMi put together wristwatches individually with unparalleled precision, using the revolutionary versatile transport system from ABB’s newly formed Robotics & Discrete Automation business. Mr Ulrich said ABB is showing how increasingly smart digital technologies are coming together to transform the way we power, produce, work, live and move. “The future of production will be smarter, more flexible and closer to the customer,” Mr noted.